"My Friends Call Me 'Billy the Kid'!" Excalibur is transported to a fantasy world. As a young lord on horseback rides through a forest in search of a knightly quest, a train suddenly appears as if from nowhere and crashes nearby. At the crash site, the lord finds an unconscious Shadowcat having been flung from the train, and Lockheed hovering nearby. Immediately smitten with Shadowcat and believing Lockheed to be a threat, he attacks the dragon. 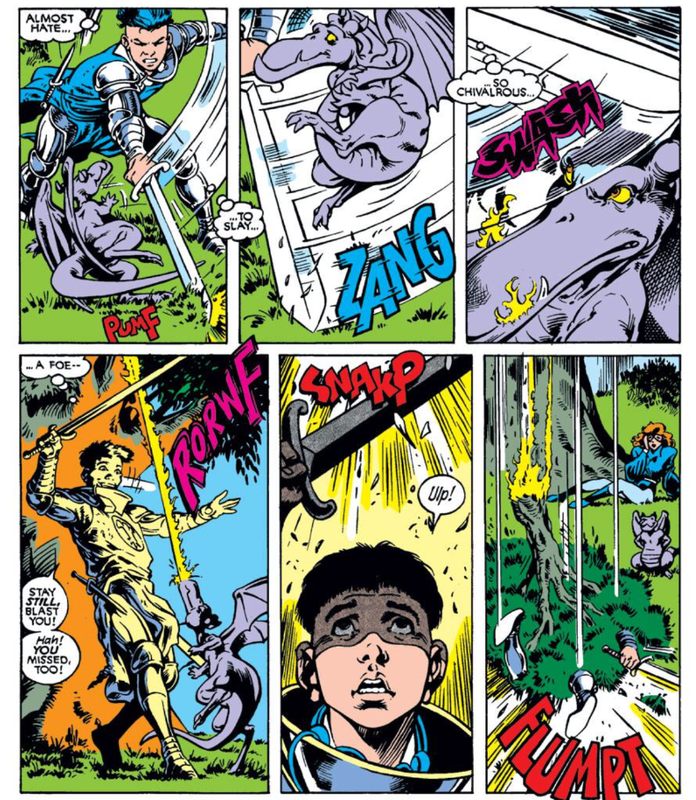 Lockheed, however, drops a tree branch on the lord, knocking him out as the rest of Excalibur, as well as Alistair Stuart, emerge from the train. Back on Earth, Nigel Frobisher meets Technet in Brighton to enlist their services, but he's transformed by Joyboy into his heart's desire, a weird amalgamation of a perfect man and Courtney Ross. Meanwhile, the young lord regains consciousness surrounded by Excalibur. He introduces himself as William, heir to the throne, but says his friends call him Billy the Kid. As Shadowcat, Phoenix and Alistair examine Widget in the hopes it can bring them home, the train is attacked by a demonic shaitan, who captures Shadowcat and brings her to its master, an ogre named Butch. He imprisons Kitty alongside a princess, but Excalibur tracks her down. As Captain Britain battles Butch, Phoenix grapples with an elemental being protecting Butch's castle and Billy frees Kitty and the princess. In the wake of the fight, Butch's castle collapses due to the damage it sustained, and though the princess is pleased to be rescued by a prince, Billy rebuffs her, instead proposing to Kitty and asking her to rule by his side as queen of the realm. 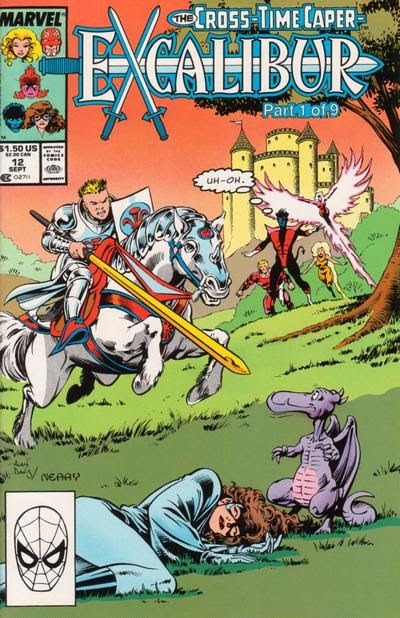 This issue marks the beginning of the "Cross Time Caper", which will see Excalibur journey to an assortment of alternate realities and times before returning home, and though the cover declares this part 1 of 9, the story ends up running even longer than that, all the way out to issue #24. The first world they come across isn't too unlike their regular world, only with the high fantasy elements dialed up significantly. By popular demand, here's Nigel transformed by Joyboy. Meggan feels an immediate connection to the new world, like she's come home. 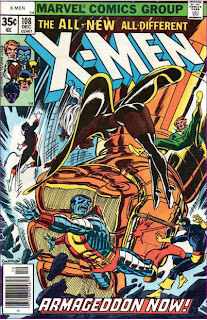 Nightcrawler teleports with a passenger, though the effort nearly kills him. Billy, however, is unaffected by the strain. Billy the Kid is obviously a reference to the famous American outlaw of the same name, but I'm not sure what, if anything, Claremont is going for with using the name here, other than the obvious "Billy is short for William, he's a kid, Billy the Kid is a name people are familiar with, so I'll call him Billy the Kid" thought process. Davis does a fantastic job of depicting Lockheed's personality just through his body movement on this page (I particularly like the way he tucks his tail up to avoid the sword strike). Prince William is immediately smitten with Kitty, and ends the issue proposing to her. Kitty, meanwhile, is still enamored of Alistair, and the Kitty/Alistair/Rachel triangle continues apace. 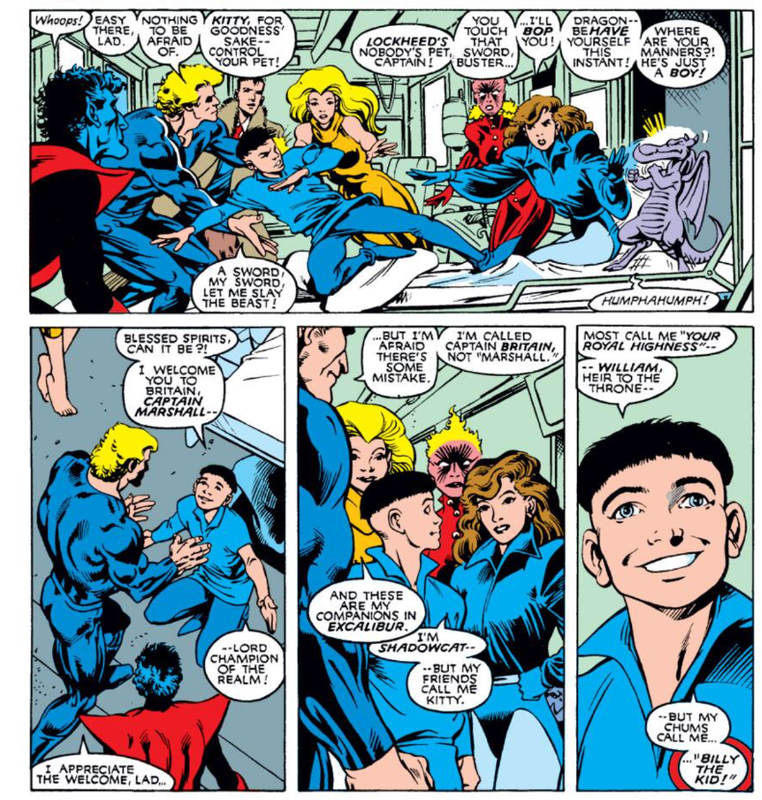 Brian finally notices Meggan's tendency to alter her form to match Nightcrawler's. This issue kicks off "The Cross Time Caper", Excalibur's entry in the 1989 multi-part storyline bonanza. It drops the cast into a world not unlike their own, but with fantasy/Arthurian elements in full swing. It's logical starting point for a story that will see Excalibur sent across multiple alternate realities, given the series' origins and ties to English mythology. Davis and Neary are back on art, which helps immensely, injecting a sense of fun and whimsy into this alternate world. 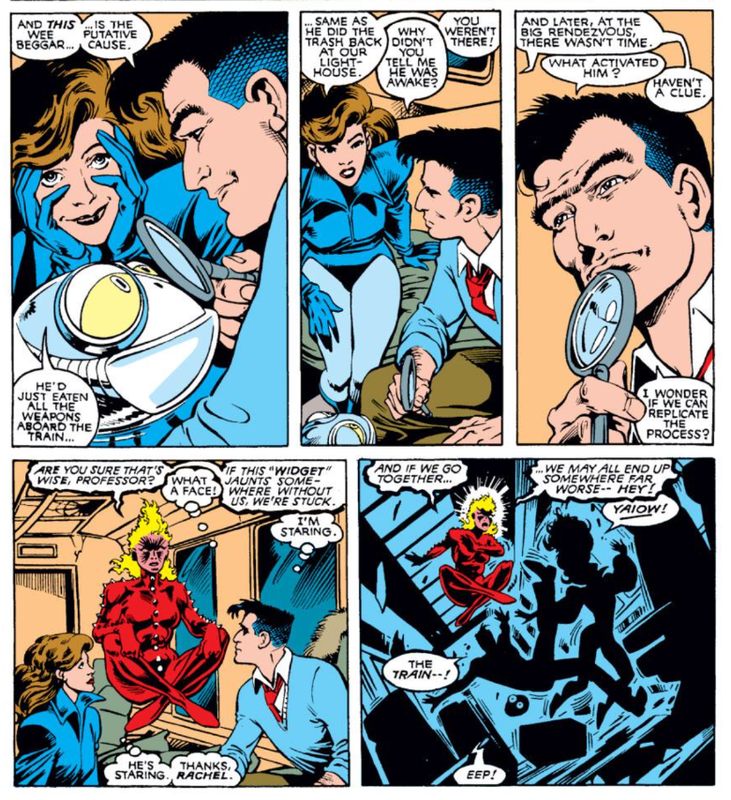 Claremont is playing around with several different romantic relationships, which is always a strong element of his work. And, in a surprising development, he even continues the "Kitty thinks she's an Ugmo" character bit begun last issue, making her the object of affection of the young prince, even in the face of her other teammates. The end result is what has become a familiar refrain for these '89 stories: a strong start (even if the story as a whole ends up running far too long). Claremont is firing on all cylinders, Davis is back, and for now, this is all just good fun. Tomorrow, "The Gehenna Stone Affair" begins in Wolverine #11, continued on Friday in Wolverine #12. Next week, the X-Men return to the Savage Land in Uncanny X-Men #249. "but he's transformed by Joyboy into his heart's desire, a weird amalgamation of a perfect man and Courtney Ross"
And you didn't include a picture of *that*? Davis is back, which, yay! Not much else to say here. It's just good, solid fun. A Prince William falling for a Katherine. Ah, life imitating art. It makes one suspicious of the ogre "Butch" being one of the Cassidy clan, at least. More with leprechauns, less with Leper Queens, that's what I say. Yeah, "Cross-Time" starts off strong. And it stays entertaining for about half its length, but that's more due to Davis's art than Claremont's writing. When Davis leaves and others take over, the storyline quickly becomes awful (then it gets a little better when Davis randomly returns for a pair of fill-ins before leaving again). I've always found the "Part 1 of 9" thing odd... How did it get extended? If they labeled it as being nine parts, wouldn't that indicate Claremont had nine chapters plotted out? I mean, I know he's prone to tangents, but you'd think that if he'd come up with a nine-part story, he'd try to stick to that blueprint. It's true that there's one inventory story mixed in, but even removing that from the equation, the story still winds up at twelve chapters (with the label also appearing on a thirteenth, but that's the issue where they get home). It really just makes no sense. I'm seconding wwk5d's suggestion that a scan of transformed Nigel be added because I didn't read this issue & am dying to see it. Question - is Billy the Kid in this story supposed to be analogous to the real-world Prince William? If so, it's funny that he's paired with a woman who counts "Kate" among her nicknames. Highly doubtful, Mela, he was about seven when the book came out. They did only recently reference the Chaz&Di wedding in Mojo Mayhem as a reasonably recent development. @wwk5d: And you didn't include a picture of *that*? @Teemu: It makes one suspicious of the ogre "Butch" being one of the Cassidy clan, at least. Ah, I hadn't thought of that. Could be. Yeah, both the NM Asgard story and XF's "Judgment War" get drawn out by a randomly inserted inventory story in the midst of their stories, but even then, that would bump this story from nine parts to ten, at most. Not twelve. Like you, I've always wondered how that happened. Like, did Claremont outline out the story, thinking it would last nine issues, but then around, I dunno, part seven, he realized he needed to expand the last few chapters? It's just hard to figure. @Mela: Question - is Billy the Kid in this story supposed to be analogous to the real-world Prince William? I wondered that too, but next issue makes it clear he's not meant to be this world's version of Prince William (his mom's a different person). That said, Claremont could very well have named the character William as an homage to the real world prince, even if he didn't intend to suggest the characters were in any other way related. "other than the obvious "Billy is short for William, he's a kid, Billy the Kid is a name people are familiar with, so I'll call him Billy the Kid" thought process. " I think it's also to create a play on expectation ... the previous issue did a Next Issue blurb with the title: You're set up to expect something set in the American West, and instead it's an entirely Anglo-centric storyline. I've done kind of a "fan edit" of this storyline -- I did a re-read of it where I cut out issues 20, 21, and 22. With issue 21, I just leave in a few subplot pages involving Kitty, Nigel and Sat-Yr-9, and ignore all the rest. Ten-part Cross Time Caper, FTW! It's works, folks, I swear! Ditto pretty much everything Matt said. I wonder if Claremont extended it because he wanted Davis to (or had promised Davis he could) finish it up. The whole thing was frustrating, due as much to it meandering as to the fill-in art — or so I recall thinking when it was published. I must have read it through since then but don't remember much. I know I stopped getting the series off the racks sometime in the middle, although I picked up the rest from quarter bins later. I have to admit to surprise in seeing now that we don't get someone subbing for Davis until a half-dozen issues along, which in retrospect probably means I just had low tolerance on my college-years budget for the creators' brand of whimsical indulgences. Blam -- "I wonder if Claremont extended it because he wanted Davis to (or had promised Davis he could) finish it up." "Alan Davis decided to leave Excalibur with issue #17 in 1989, 'Mainly because we were working right up against the deadline all the time and there was no way of getting out of that situation. That was affecting the quality and the look of the book,' Davis explained in Amazing Heroes #193. 'I had a great time working with Chris (Claremont) and working on Excalibur was heaven-sent, making it a really difficult decision to give it up. (...) I agreed to do the two fill-ins on Excalibur (#23-24 in 1990).'" Unless what you're getting at is that Claremont extended the storyline for fill-in artists while trying to lure Davis back for those two fill-ins to finish things up. By the way, not to get too spoilerish, but one of the most painful and frustrating bait-and-switch artist changes in the history of comics must surely be EXCALIBUR #24-25. The group returns to their Earth to find Galactus waiting ominously over the lighthouse, beautifully drawn by Davis, at the end of issue 24. Then #25 brings us the no-holds-barred, insane cosmic battle of Phoenix vs. Galactus, illustrated by... third-rate fill-in artist Chris Wozniak. No. I didn't have any idea, or at least any recollection, that #17 was Davis' (first) last regular issue and that his work on #23-24 was considered a fill-in. Still it's possible, albeit pure spitball conjecture, that Claremont wanted Davis back at least in part because Davis had instigated the overarching plot and was the one with the ending — to whatever extent there was an ending [see my previous statement, "I must have read it through ... but don't remember much" 8^)]. Stuart has a serious unibrow.